Directorate of Municipal Administration, Assam. 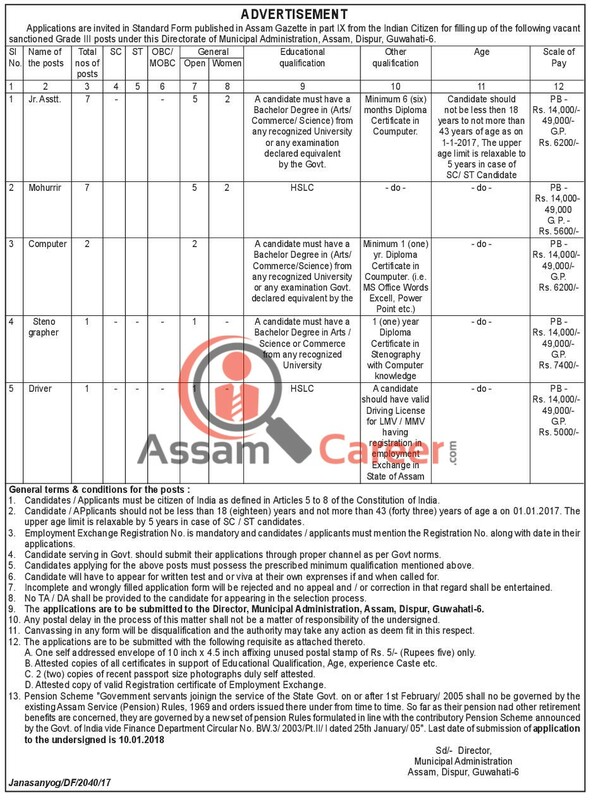 Applications are invited in Standard Form published in Assam Gazette in part IX from the Indian Citizen for filling up of the following vacant sanctioned Grade III posts under this Directorate of Municipal Administration, Assam, Dispur, Guwahati-6. Educational Qualification: A candidate must have a Bachelor Degree in (Aits/ Commerce/ Science) from any recognized University or any examination declared equivalent by the Govt. Other Qualification: Minimum 6 (six) months Diploma Certificate in Coumputer. Educational Qualification: A candidate must have a Bachelor Degree in (Arts/ Commerce/Science) from any recognized University or any examination Govt declared equivalent by the. Other Qualification: Minimum 1 (one) yr. Diploma Certificate in Coumputer (i.e MS Office Words Excell, Power Point etc.). Educational Qualification: A candidate must have a Bachelor Degree in Arts / Science or Commerce from any recognized University. Other Qualification: 1 (one) year Diploma Certificate in Stenography with Computer knowledge. Other Qualification: A candidate should have valid Driving License for LMV/MMV having registration in employment Exchange in State of Assam. Age : Candidate / Applicants should not be less than 18 (eighteen) years and not more than 43 (forty three) years of age a on 01.01.2017. The upper age limit is relaxable by 5 years in case of SC / ST candidates. How to Apply: The applications are to be submitted to the Director, Municipal Administration, Assam, Dlspur, Guwahati-6. Employment Exchange Registration No. is mandatory and candidates / applicants must mention the Registration No. along with date in their applications. The applications are to be submitted with the following requisite as attached thereto. A. One self addressed envelope of 10 inch x 4.5 inch affixing unused postal stamp of Rs. 5/- (Rupees five) only. B. Attested copies of all certificates in support of Educational Qualification. Age, experience Caste etc. C. 2 (two) copies of recent passport size photographs duly self attested. D. Attested copy of valid Registration certificate of Employment Exchange.